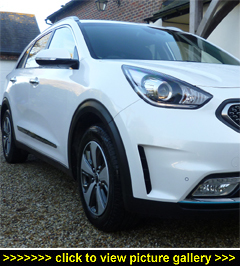 THE NIRO PHEV PLUG-IN is the first plug-in hybrid compact crossover to go on sale in the UK and wears a practical yet on-the-money SUV-esque bodyshell styled jointly by Kia's South Korean and Californian design studios. The PHEV's stance is wide, its bonnet long and the overhangs short with elevated cut-in headlamp units either side of the trademark 'tiger-nose' grille and bold flat-cut wheelarches with black protective inserts at both ends of its 'clean' flanks. Hints as to its green-ness are subtle  and blue: special chrome 'blades', with a metallic blue tint, highlight the lower front grille and the rear apron, while inside the black leather upholstery and wheel rim features blue stitching and there are blue surrounds for the fascia air-vents. The new Niro PHEV uses the same 104bhp 1.6-litre direct-injection petrol engine as the Niro hybrid that was launched previously in 2016, but is now paired with a more powerful 44.5kW (59bhp) electric motor supported by a larger 8.9kWh battery (up from 1.56kWh); together they produce 139bhp and 195lb ft of torque. While capable of travelling up to 36 miles on the energy stored in its batteries, maximise its all-electric promise and it could deliver as much as 200+mpg. What is for sure is that many owners will be able to complete their daily commute without using a drop of petrol or producing any tailpipe emissions. And even using both power sources, its low CO2 emissions are a very blue-planet-friendly 29g/km. In the real world and driven on longer trips where both the electric motor and petrol engine contribute, the official figure is 67.3mpg  expect around the 52.5mpg we averaged during a particularly demanding week's testing and you won't be disappointed; in fact, there's no reason why you shouldn't better it and clear the 60mpg marker. And when the charge in the battery pack is all used up, the Niro PHEV just carries on regardless using the petrol engine while continuing to top up its batteries when coasting or braking until you can plug-in and recharge the battery pack, either from a three-pin domestic socket or a dedicated fast-charger; the fastest time to charge from fully depleted to 100% charged is just two-and-a-quarter hours. Apart from the fluent dual-clutch automatic gearbox's six ratios (with Manual and Sport settings for more control and some additional verve), there is a Drive Mode Select switch for Eco or Normal running to obtain maximum energy efficiency or greater performance as well as an EV/HEV button. In EV mode the car runs as a purely electric vehicle all the while the energy stored in the batteries is adequate, and is able to regenerate electrical power on the move to recharge the batteries. In HEV mode the powertrain automatically balances the use of the electric motor and petrol engine for a seamless combination of electric and petrol-fuelled power although a greater proportion of it comes from the combustion engine and the charge level of the batteries is constantly being topped up for later use. While the default is for the PHEV to use the all-electric mode for pulling away, gentle acceleration and when descending slopes or braking, our advice is don't be like that other Nero and fiddle too much; just leave the system to get on with it. Do so and you'll find the PHEV driving experience to be agreeably smooth and totally stress-free, with the system seamlessly mixing-and-matching parallel drive from the petrol and electric power units for the best performance. It's also oh-so-easy to become captivated by the near-silence every time the Niro glides along in EV mode. Especially as there are no worries about lagging behind the other traffic  the Niro PHEV gets the benchmark 0-60mph done and dusted in a brisk 10.4 seconds and, at 107mph, the top speed is more than motorway capable. While its green credentials are obviously a core USP for private buyers looking to run a plug-in for environmental reasons and not just to lessen their company car tax bill, there are lots of other sound reasons to 'go PHEV'. In the Niro's case it comes with plenty of kit: not just for comfort and convenience but for safety too; and it's up to speed in the crucial comms department  all high priority items for today's drivers. Not to be overlooked either is Kia's still-unmatched seven-year/100,000-mile warranty  in the Niro's case that includes the battery and all the plug-in bits and bobs. So no worries there either. For a five-seater, five-door, front-wheel drive crossover carrying a 117kg battery pack under its boot floor, the Niro handles perfectly fine  it always feel stable on the blacktop and the suspension is adept enough to keep it honest through the twisties (and you won't hear any complaints about its ride quality either). It's easy to place too, thanks to a good driving position that gives clear views over the bonnet; rearwards visibility is equally good, and the driver's wide-view door mirror shows what's coming up alongside plus there's blind spot assist to prevent you from straying into the path of an overtaking vehicle. It's also reassuring to know that out of sight there's Electronic Stability Control and Vehicle Stability Management keeping things tidy for you: together they control skids when cornering or accelerating on dodgy surfaces. And added to that is the Niro's five-star EuroNCAP crash-test rating. Whatever the purpose of your trips  the school run, commuting to work, or setting off for a weekend break  the Niro's cabin is an agreeable place to be; not just for the driver, but for passengers too. The seats, upholstered in black leather, are nicely padded and the plump bolstering is comfortably effective  the driver is pampered the most with powered seat and lumbar adjustment along with a heated steering wheel rim (great not just on chilly winter mornings, but it also keeps your fingers flexible on much longer journeys). Both front seats have three-stage heating, height adjustable seatbelts and easy-to-adjust headrests; headroom is generous. Your front passenger will be delighted to find that they can stretch their legs right out; the person sitting behind them will be equally pleased that it's not at their expense. The cabin ambiance is welcoming with clean lines, well-thought-out ergonomics and minimal switchgear; there's plenty of high-gloss black finishing (gearlever surround, climate panel, touchscreen, door panels and steering wheel) and it's all tastefully done. The interior is well equipped with plenty of 'wish list'-grade goodies such as an eight-inch touchscreen featuring Kia's Connected Services with TomTom satellite navigation providing live traffic updates (refreshed once every minute), suggested alternative routes to avoid congestion, local point of interest searches (500 categories), speed camera and accident blackspot alerts, and an integrated reversing camera system. There's also Bluetooth, a DAB radio, and an eight-speaker 320-watt JBL premium hifi with subwoofer, external amp and front centre speaker. Naturally there's also Apple CarPlay and Android Auto for hands-free calls and texts and voice recognition, smartphone linking, and access to Google Maps navigation and Google Play music. And, last but not least, there's a wireless mobile phone charger. The driver is kept well informed with a comprehensive range of information shown on the digitised 4.2-inch TFT LCD colour instrument display including powertrain data, road speed, and navigation prompts along with the battery pack's state of charge, current usage and range, plus the currently engaged drive modes and gearbox settings. It even rates your driving style  we scored 47% Eco; 48% Normal; and 5% Aggressive. Cheeky! Should you wish, detailed energy flow and economy information can be shown on the central touchscreen which has been configured especially for the plug-in Niro to also display the location of nearby charging stations. Other kit not already mentioned includes an automatic 2Zone 'intelligent' heating, ventilation and air conditioning system designed to save battery power with a driver-side-only setting for when the other seats are unoccupied to minimise energy usage. We particularly liked the Climate button that lets you see and adjust all the settings on the infotainment screen; or you can use the traditional 'hard' buttons on the climate panel. You also get powerfolding heated door mirrors (on demand and automatically on locking and leaving), tinted glass with privacy glass from the B-pillar back, front and rear parking sensors, electric windows with one-shot fronts, a foot-operated parking brake (it's to the left of the clutch and works fine), auto-dimming rearview mirror, auto lights, and rain-sensing wipers. Kia say that the Niro is one of their most efficiently packaged cars and this certainly rings true for storage space for personal items with a drop-down sunglasses holder, good-sized damped glovebox, large siamesed cupholders, a 'cave' at the base of the centre stack for wireless charging your smartphone (with two 12v sockets and USB and AUX ports), a box under the armrest (with a fast charge USB point) between the front seats, as well as bottle-holding door bins. Plus there are plenty of safety 'assists' such as tyre pressure monitoring, drive-away auto door locking, autonomous emergency braking that will bring the car to a halt if the driver fails to react to a potential collision, hill-start assist, rear cross-traffic alert which watches both your rear sides as you reverse, lane keep assist, emergency stop signalling, speed limiter, adaptive smart cruise control, and seven airbags (front, side and curtain with one for the driver's knee). Rear passengers will immediately feel at home; the backrests are set at a relaxing angle, headroom is good and so too is foot and knee room so they can move around on long trips. Two will definitely be very comfy, helped by a large drop-down centre armrest with built-in cupholders, padded outer armrests, useful door bins and netted seatback pouches, damped grabs and their own air vents. If not snoozing they can keep in touch with the outside word through the big windows and even the views to the front between the front seatbacks are good. Other plus points include a perfectly usable middle seating position for a third rear passenger (who also enjoys a fist of headroom) plus Isofix tether and anchor points for child-seats. While cabin room is good for four (and even five), the battery pack does steal some of the Niro's boot space, clipping it to a still-practical 324 litres. However, when cargo calls, dropping the rear seatbacks creates a clean-sided 1,322-litre loadbay. Another plus point: a luggage blind cassette that's easily removed! Equally important for lugging, the 60:40-split rear seats fold fully flat which combined with a mid-thigh load height makes for back-friendly loading and unloading. In the boot you'll find two sets of charging leads (one for a domestic three-pin and one for connection to a public or workplace charging point) while under the floor is a tyre repair kit along with a useful storage tray.